MommaSaid | Happy Cancerversary! Today, I am 5. Browse: Home / 2012 / November / 09 / Happy Cancerversary! Today, I am 5. Five years later, I am happy to be here. If you believe the statistics on the Internet, I had a 63% chance of being alive today.The American Cancer Society estimates that the five-year survival rate for people with non Hodgkin’s lymphoma is 63%, which means that 37 out of 100 patients who were in treatments at the same time I was in 2007 are likely dead now. That surely puts a little perspective on the fact that it’s an “odd” day for the post-Sandy gasoline lines here in New Jersey, and yet I have an even license plate, 1/3 a tank of gas and places to go. The fifth “cancerversary” has historically been a big one in the cancer community, in part because of the oncology odds system that measures your chances of survival in one-, five- and 10-year increments. For my particular cancer, a fast-growing one that stuck a tumor the size of a softball in my left lung, the likelihood of recurrence is greatest in the first two years, which is why I had a big party/fundraiser for the Leukemia & Lymphoma Society three years ago. My odds of recurrence dropped dramatically that day, and yet I was still terrified it would come back. Now, five years (and 14 PET scans, the radiation equivalent of 28,000 chest x-rays) since the day I walked out of my last cancer treatment, I am far less frightened. I used to measure my life in three-month increments, PET scan to PET scan. In the second year, it was every four months, and then it was every six months — until now. Now I will have blood tests annually because my doctor cut me loose from PET scans. But I have decided to measure my life in five-year increments ever since one medical professional told me that your body regenerates all of its cells every five years. The cells that were in my body five years ago are all gone now. Good riddance. Now five years in remission, I am pretty darn sure I will be here to see my kids grow up, which is much more than I could say on November 9th five years ago. 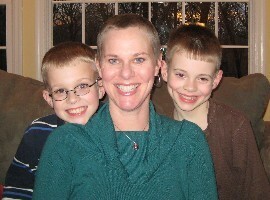 On my tenth cancerversary, my kids will be in college, and I will be looking ahead to my fifteenth year in remission. But today, I will celebrate my fifth birthday of sorts, really, truly grateful to be here. Cross posted at ParentingWithCancer.com, for parents with cancer and the people who love them. Congratulations! I just stumbled upon your blog and happened to see this. As of Dec. 22, I will be a 6 year survivor of stage II b breast cancer. That 5 year mark was incredibly huge and probably the first time I felt like I could finally relax a little. Up to that point I was nervous even planning family vacations more than a month in advance.I refused to look at any statistics… all they did was scare me. Loving the idea of 5 years at a time. Thank you! I celebrated with my brother at lunch today. I can’t wait until we celebrate 10 years, especially since he brings the Champagne. So, so happy and relieved for you! A great day!